Powered With Twin DF200APXW2 Suzuki Outboard Motors! Extra Room! Unsinkable! Dry Ride! Ice Blue Hull With White Up, Fiberglass Hard Top W/ Ice Blue Underside, White Powder Coated T Top, Deluxe Bolster Seat Leaning Post Upgrade, Flip-Out Forward Bolsters, Vacu-Flush Toilet, And More! 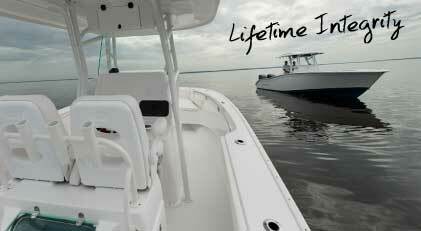 Powered With Twin DF300APXW2 White Suzuki Outboard Motors! Extra Room! Unsinkable! Dry Ride! Vacu-Flush Toilet System, Fiberglass Hard Top With Aqua Mist Underside, Powder Coating T-Top/Splashwell Rod Rack, Hardtop Rear Legs To Leaning Post, Rupp Revolution Outriggers With 18′ Poles, And Much More. Powered By Triple DF350ATXW2 White Suzuki Outboard Motors! 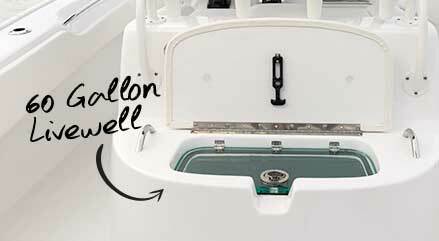 Vacu-Flush Toilet System, LED Underwater Lights, LED Under Gunnel Lights, Fiberglass Hardtop With Steel Blue Underside, Windlass, Maple Cushions, White Powder Coating HTop/Backrest/Splashwell Rod Rack, And More. Another Cape Horn first. After 30 years of hands-on, real life testing and thousands of miles of running into heavy seas, we found exactly what it takes for the softest entry and driest ride. A proprietary designed cutwater helps smooth out the bumps while the reverse chines direct any spray down and away from the hull. Increased speed and fuel economy are a result. We talk a lot about the strength, wood-free design and the thickness of our hulls. Another key factor in our legendary ride is pressure filling every inch of empty space in the hull with closed cell foam. 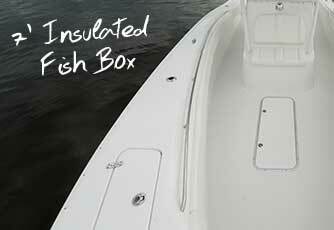 The foam quiets the ride, adds stiffness to the hull and makes every Cape Horn absolutely unsinkable. With a unique construction process, Cape Horn is unlike any other. Our sculpted process prevents us from ever mass producing these boats, but mass production is not part of our agenda. This process is slow and contributes to our limited production, but guarantees an all-composite boat that will out last its owner.